We publish guidance for osteopathic students and osteopathic educational institutions about student fitness to practise. The GOsC publishes guidance for students and osteopathic educational institutions to ensure the appropriate and consistent management of behaviour that indicates students may not be fit to practise. Registration with the GOsC requires osteopaths to practise in accordance with the Osteopathic Practice Standards and hold a Recognised Qualification. Osteopathic educational institutions are responsible for ensuring that only students who are capable of practising to these standards, without supervision, are awarded a Recognised Qualification. This guidance outlines the role of the osteopathic educational institution in relation to student fitness to practise and suggests a suitable framework for the management of fitness to practise issues. The current guidance documents, available to download below, are revised editions. Details of the revision process, including a consultation, can be found in a paper presented to the Policy Advisory Committee in 2016. 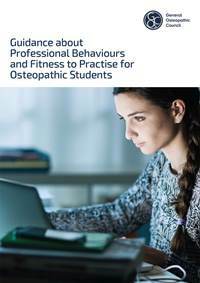 Guidance about Professional Behaviours and Fitness to Practise for Osteopathic Students. Student Fitness to Practise: Guidance for Osteopathic Educational Institutions.